AT the quick pace the world is moving at, instant noodles are heaven sent. Especially when time is tight and one wants something hot, tasty and satisfying in the comforts of home or even the office. 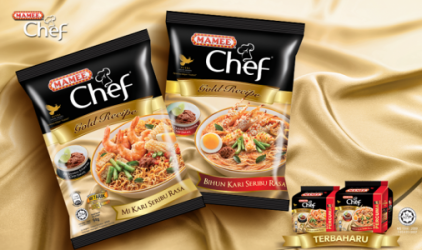 The brand Mamee Chef, under Mamee-Double Decker Sdn Bhd, made its debut late in 2012. It created competition in the instant noodle industry not long after and was awarded the fastest growing new product in the market. Further into its development, the brand collaborated with the renowned Datuk Chef Ismail to come up with three new variants – Creamy Tom Yam, Curry Laksa and Spicy Chicken Shiitake. Mamee Chef was also the first instant noodle brand to use condiments and a paste mix. It also applied the “Mi Tarik Technology” in manufacturing its noodles. This concept was adapted from China. It produces springier and smoother textured noodles for a tastier and more satisfying experience.